Dr. McNemar is blessed to be supported by a talented and compassionate group of staff members who help manage day-to-day operations and provide a consistently high level of care to each and every patient he serves. Here are just a few of the people you will get to know at his office when you come in for your consultation, surgery, and follow-up visits. Tiffany has been with Dr. McNemar for 3 years. She has experience and knowledge in both pre- and post-operative care, booking surgeries, obtaining insurance authorizations. She is also able to answer most questions you might have when beginning your quest in looking into cosmetic surgery. She combines a tender, compassionate attitude with excellent skills to comfort even the most apprehensive and concerned patients. Tiffany has been a Registered Medical Assistant (RMA) for 8 years and graduated at the top of her class. She also has spent 5 years working in an Emergency Trauma Center. "It is an honor to work for somebody as talented and caring as Dr. McNemar," says Tiffany. "When you can go to work everyday and enjoy what you do and who you work with, it's a blessing. It's amazing to watch firsthand the kinds of changes that can be made to the body and the way it can make a patient feel when they are done. Seeing them leave with a new self confidence after their surgery is amazing." 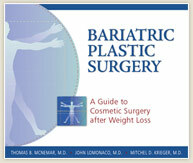 If you're considering cosmetic improvement after obesity surgery in San Francisco or Northern California, request your consultation today and receive a complimentary excerpt from Dr. McNemar's latest book, Bariatric Plastic Surgery: A Guide to Cosmetic Surgery after Weight Loss. Or, call (925) 866-0177 for our San Ramon office or (209) 834-0626 for our Tracy office to make your appointment.